Resounding message of economic development conference is modernity – but violence, oppression and malnutrion are still rampant in Egypt. On the shores of the Red Sea, something is rumbling. It’s not the helicopter gunships orbiting the skies or the Special Forces combat troops – their faces obscured behind thick balaclavas and dark goggles – that patrol the sun-kissed streets. 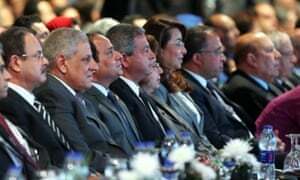 The rumble is emanating from inside Sharm el-Sheikh’s international congress centre, where business titans and heads of state are slapping backs and breaking bread, leaving a trail of Danish pastry crumbs in their wake. There is nothing remotely representative about a palatial conference held entirely inside a bubble, beyond which an armed insurgency is raging in northern Sinai, an average of four bombs a week areexploding in Cairo, and a third of young children nationally are afflicted bymalnutrition. But it is true that, under President Abdel Fatah al-Sisi, Egypt is very much open for business. New investment and bankruptcy laws will grant blanket immunity to investors and public officials when handling state funds, loosen restrictions on public assets being handed to the private sector free of charge, and enable foreign companies to abandon privatised projects virtually without penalty if they so choose. Entire infrastructure classes are being lined up for takeover by public-private partnerships; meanwhile corporate and top-end personal income taxes are being cut, and workers’ ability to strike restricted. The narrative at the conference has been that this is all so very new. From the plenary hall stage to the bustling bilateral meeting rooms, the sponsored lunch tables to the specially commissioned ‘Marketplace’ smartphone app – for ‘leaders and game-changers’ can arrange to come together for ‘brain dates’, a sort of neoliberal Tinder – there is an all-pervasive aura of buoyant razzmatazz, as if nobody can quite believe how fresh and positive Sisi’s Egypt feels. 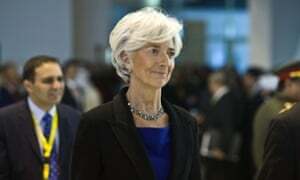 The event was produced by Richard Attias & Associates (RAA), a strategic consulting firm run by the man behind the annual World Economic Forum in Davos. RAA shares its London headquarters with Global Counsel, the lobbying firm run by former Labour minister Peter Mandelson – who publicly defendedGamal Mubarak, son of the president, when the revolution first began. Mandelson is also on the board of Lazard, the financial consultancy outfit advising Sisi’s government on economic policy. RAA and Global Counsel are both affiliates ofWPP, the world’s largest advertising company, Its CEO, Sir Martin Sorrell, was a keynote speaker at the conference. 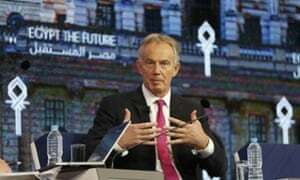 Blair, revealed by the Guardian last year to beadvising President Sisi as part of an Emirates-funded consultancy programme, was another star turn on the stage. Egypt’s direction of development is vitally important, though who will benefit from it remains an open question. For all the buzzwords at the conference regarding shared benefits and economic inclusion, Sisi has so far adopted a wearilyfamiliar austerity playbook; although foreign investment could potentially be harnessed for the good of Egypt’s 90 million-strong population, as long as the state and its economy continues to be under the iron grip of military generals who brook no opposition and corruption continues to run rampant, it is hard to see how Sisi’s open-for-business Egypt will turn out any different from Mubarak’s.